No, I don't mean I've slept for almost 3 weeks ;-) I mean this particular state of mind of waking up with a vague memory of a crazy party last night, but at the same time unwilling to open your eyes for the fear that the person lying next to you is really the one you think it is. Welcome. There is no doubt that since the 4th of July we have a new particle, a boson with mass near 125 GeV. There is little doubt that this particle is a Higgs boson. True, the discovery relies to a large extent on observing a resonance in the diphoton spectrum, which could also be produced by another spin-0 or even a spin-2 particle that has nothing to do with electroweak symmetry breaking. 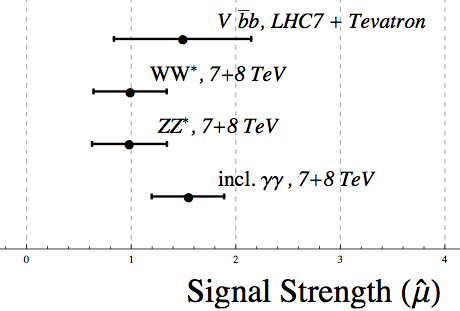 What convinces us of the higgsy nature of the new particle is the signal in the ZZ and WW final states. Indeed, the coupling [h V V], allegedly responsible for the decays to W and Z bosons, is a watermark signature of a Higgs boson, as it is central to its mission of giving mass to gauge bosons. Farewell. Welcoming the Higgs, we need to clean the room of some old toys we've got used to. First of all, Higgsless technicolor for obvious reasons goes into the trash bin of history. So does the unhiggs or the whole class of stealthy Higgs theories where the Higgs was supposed to escape detection by decaying into complicated final states. Quite robustly, the 4th generation of chiral fermions is now excluded because, if it existed, the Higgs production rate would be many times larger than observed. Finally, a simple and neat theory of dark matter that annihilates or scatters via a Higgs exchange, the so-called Higgs portal dark matter, is getting disfavored because Higgs would have a large invisible branching fraction, and thus a suppressed rate of visible decays. Hope. The Higgs data from ATLAS and CMS match well the Standard Model prediction with one exception: the diphoton event rate is 50-100% too large, with the significance of about 2 sigma. These are most likely statistical fluctuations, but if the enhancement persists when more data is collected it may become the first clear evidence of new physics. If that is the case, the most plausible interpretation of the current data is that the enhancement is due a light 100 GeV-ish scalar or fermion that carries electric charge but no color. This way the loop contributions of that particle could affect the Higgs decays into photons without messing up the gluon fusion production mode. Furthermore, the new scalar or fermion needs to have a large coupling to the Higgs boson, but its mass has to come dominantly from another source (otherwise it would actually decrease the diphoton rate). If it were confirmed, it would be a particle that apparently no one ordered. On the other hand, theoretically cherished particles (stops, little Higgs top partners, staus) all require a serious tuning and some conspiracy to fit the available Higgs data. Nightmare. Despite what I said above, one cannot help noticing that the data are indecently consistent with the simplest Higgs boson of the Standard Model. Overall, adding the 8 TeV data improved the consistency, eradicating some of the hints of non-standard behavior we had last year. It's been often stressed that the Higgs boson is the special one, a particle different from all the others, a type of matter never observed before. Yet it appears in front of us exactly as described in detail over the last 40 years. This is a great triumph of particle theory, but at the same time it's very disappointing to those whose future existence depends on new physics, that is to a large majority of particle theorists. In summary, Higgs hunting is over, the catch is now being skinned and prepared for grilling. Collider physics has achieved the most spectacular success in its history. At the same time, it came dangerously close to realizing Kelvin's nightmare, of science reduced to striving for the next decimal places of accuracy. Well, 100 years ago we avoided that fate, may be the history will repeat itself? Technicolor could be gone, but perhaps Composite Higgs could come to revenge it? What do you think? It is very Dual/Stringy thing, and it has to me a peculiar value: it sometimes invokes square roots of the yukawa couplings. Alejandro, yes sure, Composite Higgs is alive. There's currently no hints whatsoever of Higgs compositeness, but it remains a plausible possibility. Well, I have always been amused that the Z mass value is such that its reduced total width, Gamma/M^3, is equal to the one of the pion (hep-ph/0603145 and plot here: http://dftuz.unizar.es/~rivero/research/nonstrong.jpg . If at the end it is some superstrong bound state, it could be an explanation. Really there is a lot of, to me, loose ends that could be solved by a composite Higgs sector. RE this possible charged scalar - could it be an S-wave Cooper pair type thing? cf Dirac's old theory of the superconducting vacuum..
"Indecently consistent" is a nice turn of phrase. A question from the totally ignorant (someone outside the particle discipline): in what sense is a fourth generation excluded? Is in "within a certain class of models"? Or absolutely? If it were absolute, wouldn't that be the end of string theory, with its required tower of states? Can you help me understand? I think the 4th generation, in the sense of another copy of the SM generation of fermion, is robustly excluded because it predicts a completely different Higgs phenomenology than what is observed. But it does not mean there cannot be new heavy particles - only fermions identical to the known ones in all details except for the mass are excluded. The would-be string excitations do not belong to that class. Thus, Higgs measurements (or any other LHC measurement for that matter) tell you nothing about validity or non-validity of string theory. The main difference is that as opposed to the "fourth generation", the mass of these "vibrational" string states and Kaluza-Klein states does not mainly come from the Higgs. This allows them to be heavy without interfering too much with the Higgs and the rest of the Standard Model, thus they can be somewhat hidden from our low energy observable physics. The trouble is mainly with hypothetical new heavy particles like the fourth generation which purely obtain their mass from the Higgs - those put a great "strain" on the rest of the Standard Model, strongly interfere with the behavior of the Higgs and the W, Z bosons, and are therefore mostly excluded experimentally. in the hypothesis of a composite Higgs boson, which could be its potential components ? Besides, which are the main theories that would be compatible with this kind of hypothesis, and do they imply the same kinds of components for a composite Higgs ? Finaly, would it imply that the Higgs' mass is less precisely defined and could it be a way to eventualy falsify this hypothesis ? Mass of H^2 = W^2 + Z^2 give or take a quark. S. Vik's observation has been added to my compilation of tHWZ numerology.